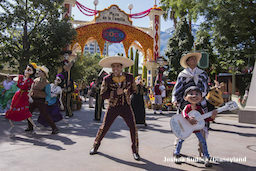 First of all, in DCA they’re celebrating the Day of the Dead, or Dia de los Muertos, with Miguel from Coco. At the Plaza de Familia guests can join the fun at the memory wall where they can put messages for their families, those who have passed and those still alive. There are plenty of things to do here and some special food just for the holiday. And there is a wonderful musical celebration, which includes an appearance by Miguel. This musical celebration is upbeat and the entire area is colorful and happy. This is definitely a place that celebrates family and family love. 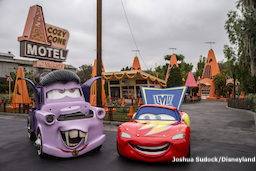 Then over in Cars Land, they are celebrating the holiday with their Haul-O-Ween celebration. Mater’s junkyard jamboree has new songs for the occasion, and there are decorations galore throughout the land. Look up, sideways, and everywhere to enjoy all the special intricate details that went into decorating this land for the holiday. 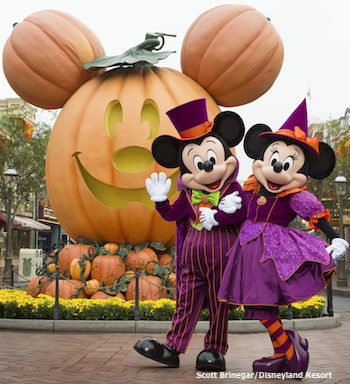 Halloween is the time filled with special – and sugary -treats and Disneyland Resort is no exception. The chefs have created some amazing food for the holiday and there are some novelties, including seasonal popcorn buckets and mugs that all glow and light up. As far as the sugary delicacies, there are several flavors of churros (try the s’mores churro), a really yummy spooky cone macaroon, cake pops, caramel apples, croissant donut (looks like a mummy), Mickey mummy macaroons (can you say delicious? ), and so much more. This is not the time to think about calories. Just enjoy these delicious treats because they are only here through October 31. Vampirina is at DCA to visit with guests. She’s a favorite among pre-schoolers who always want to give her a hug and visit with her. 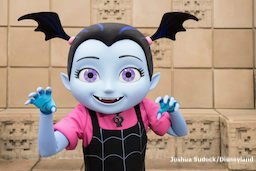 Her show on Disney Junior is popular and Vampirina has a loyal fan-base. Because she’s a little vampire, Halloween is a tailor-made holiday for this cutie. What’s Halloween without the Haunted Mansion? This is the 25th anniversary of The Nightmare Before Christmas and the Haunted Mansion is once again decked out with all the characters and fun from that film. Jack Skellington and Zero are inside to greet visitors as well as a giant gingerbread house that this year is being overtaken by a five-foot spider with glowing eyes – 90 pounds of gingerbread, 30 pounds of confectioner’s sugar, 10 pounds of white chocolate, and 45 pounds of fondant went into creating this gigantic confectionary delight. The outside of the mansion is decorated as well as the inside, making the Haunted Mansion a special Halloween spot for every visitor to the park. Main Street USA celebrates the season with a pumpkin festival and Mickey, Minnie, Donald, and the gang are all decked out in their Halloween costumes strolling around the park. Don’t forget to pick up a Halloween Time food list when you enter the parks. They have the location of each special treat and a check off box so you can keep track of all the goodies you get. 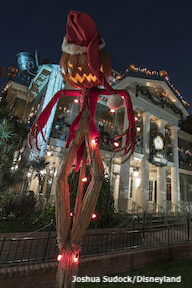 There is much more holiday fun throughout the two parks. Sights, sounds, and smells greet guests at every turn. Nighttime brings more special times with Mickey’s Halloween Party (requires a separate ticket). But don’t wait. Halloween Time at Disneyland Resort only runs through October 31, 2018.